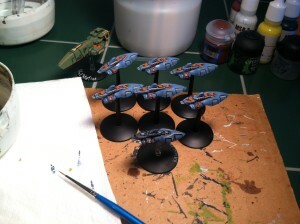 Squadron B with Val’Netine and Krikalev. The other things worth noting are: the Ravenstar models are resin, slightly larger in volume, and have a mounting hole in their “keel”. The holes are kind of small — there was a little bit of knife work necessary to widen them for GW bases — but that’s an improvement over the Xtreme Hobby lead, which required drilling a hole in the hull. Next time I put so of these together, I’ll remember to take a picture and do some measurements. This entry was posted in Conventions, Starships and tagged EsCon, hot rod, ravenstar studios, starships. Bookmark the permalink.